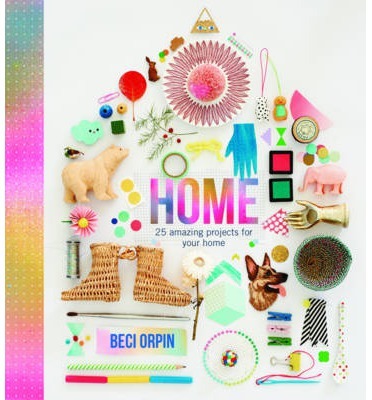 HOME is the latest book by the ever-talented Beci Orpin, filled with Beci's unique craft and design projects that are guaranteed to brighten your house and your life. HOME will appeal to fans of Beci and to those who loved her previous publication, Find & Keep. Filled with 25 creative projects, each individually imagined by Beci, and designed especially for the home environment, HOME will make you fall in love with your house, all over again. Similar to Find & Keep, HOME is filled with inspiration and crafty ideas, along with projects designed by Beci, but this time specifically created for you home. The book is separated into three spatial areas: Living Space, Working Space and Sleeping Space. Each chapter is filled with photos and quirky illustrations from Beci, along with solid ideas on how to beautify your home, Beci style. At the end of each chapter there is a collection of projects created by Beci especially for this book, each with a varying level of difficulty, but definitely something for everyone. Try your hand at making cushions, or creating your own duvet cover. Be inspired to design your own wall art, or perfect your workspace with carefully designed space-saving techniques that are both beautiful and functional. Enter the world of Beci's HOME and be inspired to make and create objects and artwork that will enhance your living space and make your house feel all brand new again.